Subway: Hongdae University Station Exit 1 five minute walk. 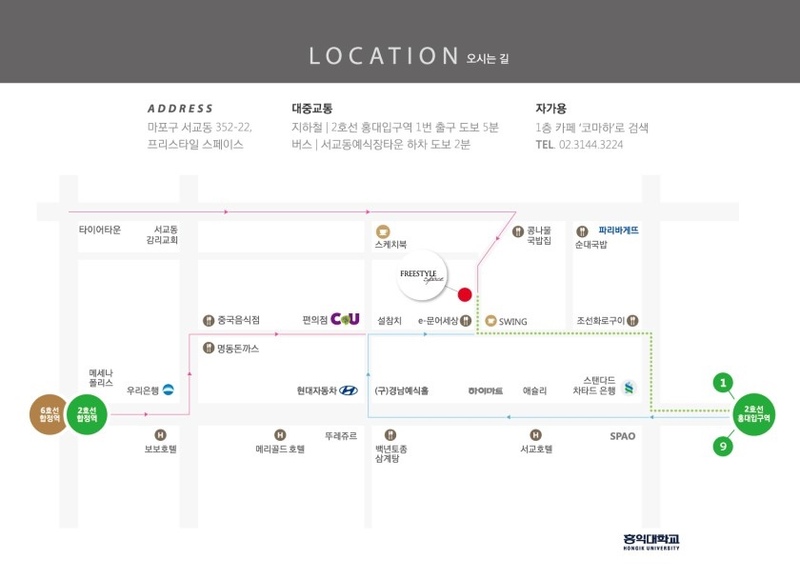 Bus: Seokgyodong Yaeshik Town Ha Cha, 2 minute walk. When you Hongdae University Station exit 1, walk South towards “Line Friends Store”. Cross the 4 way traffic light and you will see a “Standard Charter Bank”. Make a right walk about 10 meters and then make your first left into the back street. Go straight for less than a minute and you will see “Swings” make a right and then you will see Freestyle Space/Comaha Cafe! We will be waiting for you. 1. Exit Gangnam Station exit 11, Turn right after walking straight for 150 meters. (You'll see a CGV and McDonalds.) Look for "Asilah" restaurant. Walk down the steps. Ocean Springs is on level B2. 2. Exit Line 9 Sinnonhyeon Station exit 5, walk about 400 meters straight, and walk 100 meters straight uphill in the alleyway on the left of Lotte Cinema, and take a right to see "Asilah" restaurant. Ocean Springs is at the 2nd basement floor! 2016.8.17 | 지도 크게 보기 © NAVER Corp.